Irish pint glass refrigerator magnet. Does this black and cream pint magnet remind you of a famous Irish stout? This magnet is in the shape of an Irish pint glass that is enhanced with a shamrock along with the word Ireland and a bonus shamrock in the foam. 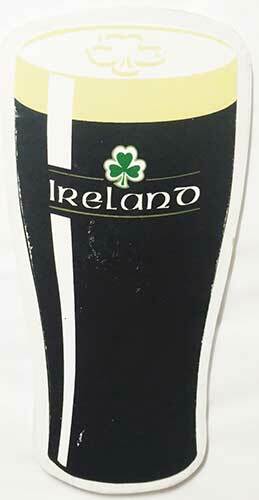 The Irish pint glass is a laminated wood design with a printed face. The Irish magnet measures 3" wide x 6" tall and is made in the United States by a local artist. The Irish pint fridge magnet is received with a shamrock history card, complements of The Irish Gift House.